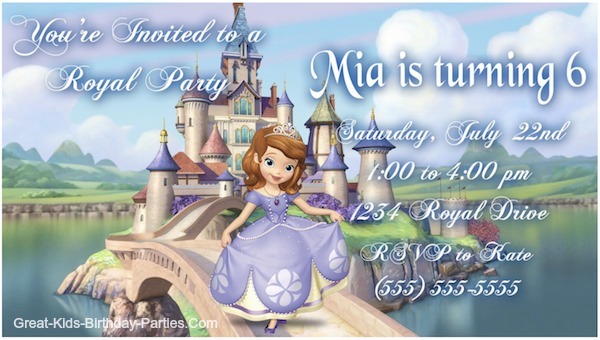 Start your royal party with beautiful Sofia the First invitations. We have free DIY custom invitations, Sofia invitation backgrounds, printable invitations, ticket invitations and lots more. Children's parties are a lot of fun and but let's face it it can get costly very quickly. We want to give our children the best party ever without breaking the bank. One easy way to cut costs is to make the invitations yourself. There are so many creative ways to make personalized Sofia the First invitations. They look beautiful and set the stage for the excitement that's to come. These invitations are easy to make, some in just minutes! Our first invitation is one of our favorites, mainly because it "looks" custom made (and paid for) and you won't believe how quickly you can make them. 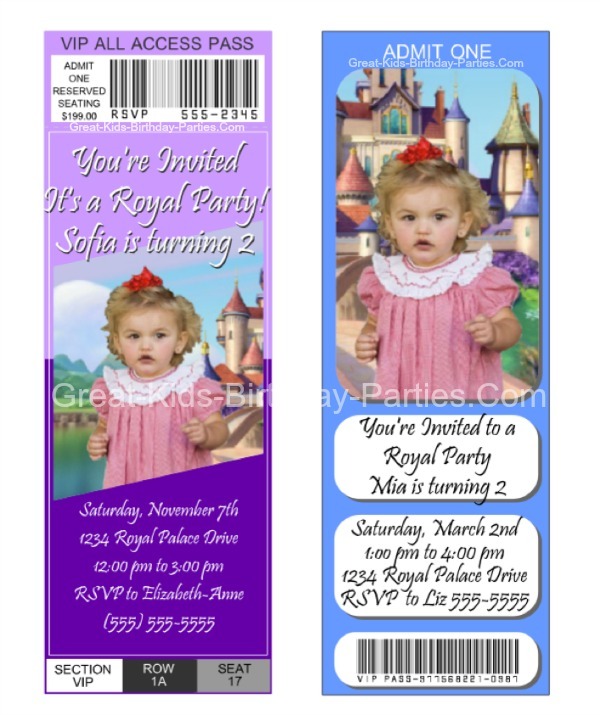 These personalized Sofia the First ticket invitations were made using printmypic.com and took just minutes to make, and they look as pretty as the one's you can order. The only thing you need before you start is to have the image or photo you want to use ready on your computer. No need to be precise with image size because you can increase and decrease size and you can reposition your photo when you are editing it. Use the big arrows and big "+" and "-" signs for bigger movement of image. Use the smaller arrows and signs for little changes. You can add your child's photo instead of a Sofia the First image, and if you're feeling creative you can prepare your child's photo before uploading it by placing the photo in front of a Sofia the First background (like her castle). See image below on left using Ticket No. 9. The second invitation below (right) was made by adding the birthday child's picture in front of Sofia's castle and using Ticket No. 3. As you can see there are many possibilities and they are really very easy to make. You can print from 1 up to 4 invitations at a time. For a more professional look, print on card stock or photo paper. Are you ready to begin making your own Sofia the First invitations? Then click here and have fun creating your own free ticket invitations. You will be amazed at how quickly you can make them. This next free DIY invitation was made using fanpop.com which is a user-generated fan club. Fans connect with other fans and share photos, news and opinions on their favorite celebrities, tv shows, movies and more. Any image you might want to add, like a picture of Sofia or a picture of your child. Open 2 screens side by side if possible or 2 tabs so you can continue to read this and create at the same time. 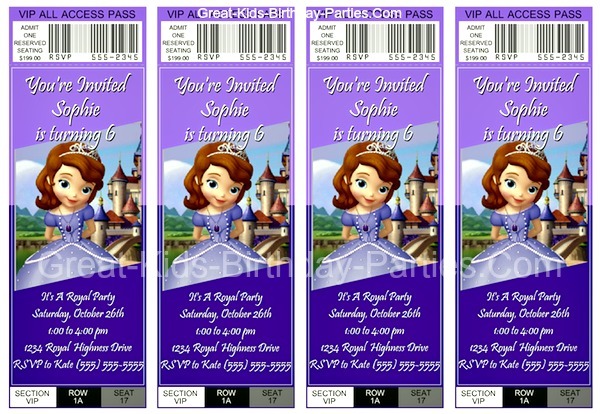 To make Sofia the First invitations like the one above, click here. This link will open to the background we used for the invitation above. You're screen should look like the one below. Hover the mouse over the image and 2 tabs will appear. Click on "customize image". Then go to the photos tabs (between the frame and MEME tabs) above picture. Add your image to the background. then click on "T" tab above picture to add your text. Here you have a choice of fonts, sizes, and other options. Click on "save" then download to save to your computer. If you want to share your creation, you have to sign up (it's free) first then fill out title and description and then click "save". 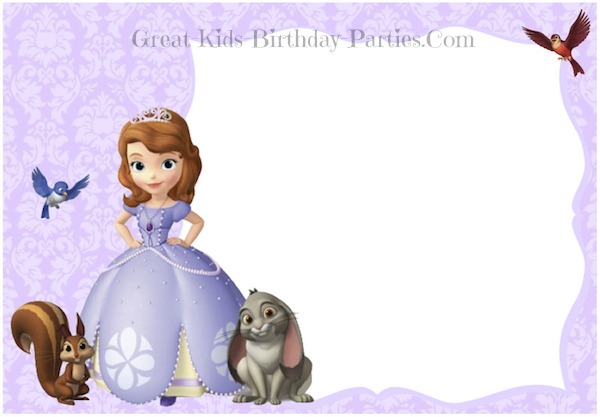 Use this Sofia the First blank invitation and fill in your party information. We made one large template so you could re-size the invitations without losing picture quality. Download template here and then reduce to your preferred size.